We all know that crime does not pay. Sometimes, however, the strangest things come out of time spent in prison. Such was the case with Werner von Siemens, the great scientist and entrepreneur who brought the world closer together through the development of large-scale telegraphy systems. Doctor Siemens was born in Germany in 1816, the eldest of seven brothers, all of whom achieved distinction in the pursuit of science. His early life was spent in acquiring an education at the Gymnasium of Lubeck, and afterward in the study of military practice and theory. In 1841, while Siemens was serving in the Prussian army as a means of paying for his engineering education, a fight broke out between two fellow officers, resulting in a challenge to a duel. Siemens stood in as a second and was subsequently arrested. Sentenced to a brief prison term, Siemens used the time to conduct chemistry experiments. In 1842, he produced his first invention, a gold and silver electroplating process. From such adverse beginnings, he would go on to form one of the first and longest-lasting multinational corporations in the world, Siemens AG, and to change forever the way the world communicates. Though he began his scientific career in chemistry, Siemens made his name in telegraphy, which at the time was an emerging technology. The first electric telegraph was invented by Charles Wheatstone in 1837. When Siemens saw a model of it, he at once saw the possibilities for international communication. At the age of 28, he was appointed superintendent of artillery workshops and devoted his attention to the application of mechanical, electrical, and chemical science to the defences of his country. In 1847, along with an aspiring young engineer named Johann Georg Halske, he started the Siemens and Halske Telegraph Construction Company. In 1848, he was contracted by the Prussian army to build a 600 km underground telegraph line between Berlin and Frankfurt am Main. Shortly after its installation, Siemen’s telegraph would prove decisive in the German revolution of 1848 by facilitating rapid communication between the Prussian monarch in Berlin and the General Assembly in Frankfurt. From the beginning, Siemens thought of the telegraph in global terms. He opened offices in London, Paris, St. Petersburg, Vienna, and Berlin. Soon telegraph lines crisscrossed Europe. Though he was head of a multinational corporation, Siemens devoted his time to research and development. In 1866, he solved one of the great problems in electrical engineering—the need for DC batteries to generate electric current and high voltage. His dynamo-electric principle started a new era of electricity and established Siemens as a household name throughout the world. Some of Siemens’ other major inventions were the first electric cable car (1879) and the first electric street lighting (1882). However, Siemens’ greatest contributions to the modern world remained in telegraphy. Using scientific methods, he perfected ways of manufacturing and laying telegraph cables and that improved performance and lessened technical difficulties. Today, Siemens is the international unit for electrical conductivity. 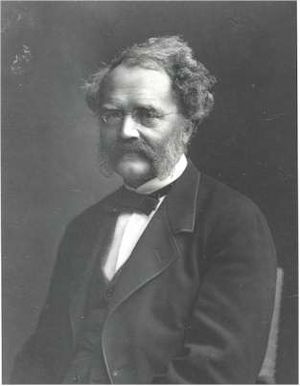 Werner von Siemens was enormously successful and was much admired for his achievements. He received from the University of Berlin, in 1860, the honorary degree of Ph.D. Among other honors, a patent of nobility was conferred upon him by the Emperor Frederick III, and he had received the highest scientific order of his country, the Prussian order, "for merit," in 1888. Some of his contemporaries regarded him as the father of electricity. He died in 1892, but not before establishing a legacy that continues to this day. More than 150 years after he formed the company, Siemens AG today is a multinational corporation employing 376,000 people in 150 countries with sales topping in at $74 billion per year. This page was last edited on 14 September 2017, at 14:40.